That didn’t take long. Just a few months after housing experts predicted a soft recovery, their pessimism has quickly turned into optimism. Per the latest Zillow® Home Price Expectations Survey, which comes from 113 economists, market strategists, and housing experts, home prices are expected to rise 2.3% in 2012. That’s up from a previous forecast of -0.4% in the June survey. Yes, just three months ago, depreciation was the word on the street, even though the bottom was largely agreed upon. The most optimistic respondents in the latest survey predict home prices rising 4.4% this year, while the most pessimistic see an average increase of just 0.3%. The group also upped their home price appreciation predictions for 2013 through 2016, meaning we should see steady growth for years to come. Zillow Chief Economist Dr. Stan Humphries noted that the group hasn’t been this bullish since mid-2010, when the homebuyer tax credit boosted demand artificially. Humphries even referred to it as “further evidence” of an “organic recovery,” though you have to wonder if he’s forgetting about the mortgage rate manipulation taking place at the Fed. Sure, the correlation between home prices and mortgage rates is a tricky one, but you have to assume demand has risen as a result of the unprecedented low rates on offer. 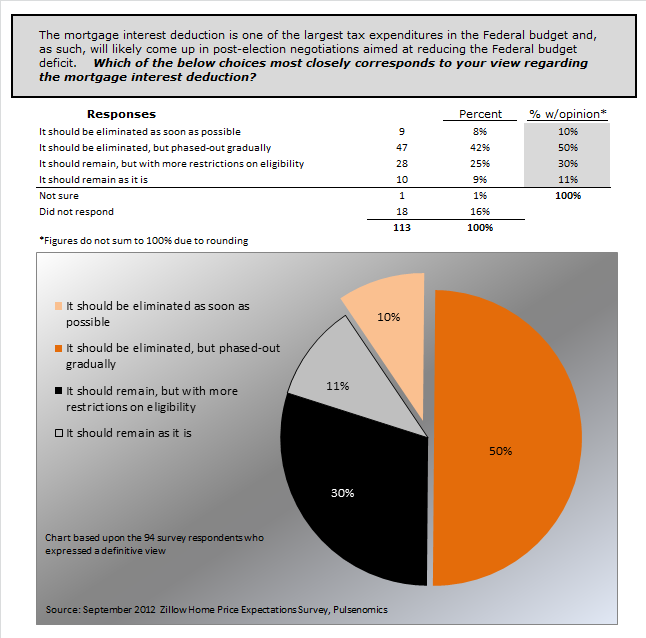 Zillow also asked what should be done about the now under-fire mortgage interest deduction. About half of respondents believe it should be eliminated, but phased out over time, while 10% feel it should be eliminated as soon as possible. Another 30% believe it should remain, but with more restrictions, and 11% think it should remain intact as is. While changes may be advisable, you have to wonder if messing with anything right now that could diminish homeownership would be the right move. The problem is it supposedly costs the federal government about $90 billion a year, and certainly helps homeowners disproportionately. The issue of eminent domain and political leanings were also included in this edition, with an overwhelming 91% against the former. As for politics, 34% said they were voting for Obama, and 45% were on Romney’s side. Another 20% were undecided, and leaning in either direction. Regardless of which candidate they favored, 47% felt Obama would promote “more significant” housing policy changes, compared to just 21% in the Romney camp. However, 25% felt Obama’s initiatives would impair the housing market, while just 17% felt his policies would bolster the market. An even greater percentage (27%) felt his policies would have no meaningful effect whatsoever. And they’re probably right. For the most part, many of the weapons in the arsenal have already been fired, including Hope Now, HAMP, HARP, HARP 2, and many other programs. The only biggie missing is a program for private-label mortgages, which likely wouldn’t happen without bipartisan support. Additionally, now that optimism has returned to the housing market, you have to wonder if any wildcards that haven’t been played will be. Obama may have had an ace up his sleeve, but if confidence has already returned to the market, there may be no need to exercise such an option. We know mortgage rates are going to stay low, longer, thanks to the Fed’s new QE3 initiative, and with home prices on the up, more underwater borrowers will be able to unshackle themselves from their negative equity problems. So it may be reasonable not to expect any more support from the government on the housing front. 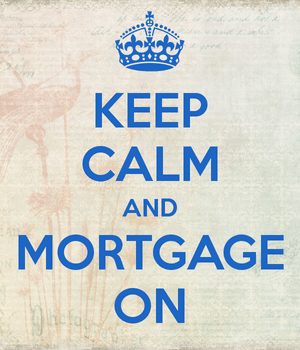 Read more: Why your mortgage may get more expensive.